Capital of the country is an European - like seaside town. and unfinished mosque, Hassan Tower. on local people's daily life,. 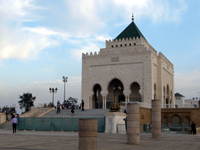 Mohammed V was a powerful king at the time of Morocco's independence from France. A mosque with Hassan Tower was planned to be built in 12th century and never finished.